Thailand, as with almost every other country in the world, has turned its full attention to the World Cup. The Bangkok Post has launched a “Special Content” page within their sports section to display photos, timetables (with game times posted in GMT +7 hours), and brackets. Because we are five hours ahead of South Africa, many of the games start well into the night here, rendering football fans very sleepy during the day. My English co-worker Pi Tuk, for example, told me during lunch the other day that she went to bed after 1:30 am the night before (practically unheard of in a region where people normally rise at 5am) and needed a nap. Sure enough, that afternoon I saw her napping on a comfortable fold-out lounge chair in the library. Napping teachers are not a new phenomenon in Thai schools (especially during severe heat) but this was the first time I saw a female teacher take one at my school. Living in a country other than the U.S. during the World Cup has helped me realize how important and unifying football is for the international community. The tournament has given me something more to talk about with my principal and co-workers than the weather and the spiciness of the som tam. It’s really fun to hear my teachers talk about last night’s games and upcoming matches. I’m also learning more vocabulary, like how to pronounce more countries’ names and the word for “goal” (which, interestingly enough, is the same as “door”: pra-tuu). The other day when I visited the local post office, I immediately noticed the triangular banner of the World Cup team flags strung above the counter and the clerk told me he’s cheering for Spain, a country I also called home for a time. It’s been fun feeling more connected to a global event even in the far reaches of Isan. I will be the first to admit I’ve never watched a full football game on television before, and have never played the sport, but even I am feeling the pull to read up on the latest scores in this environment. Now if only I had a TV…. 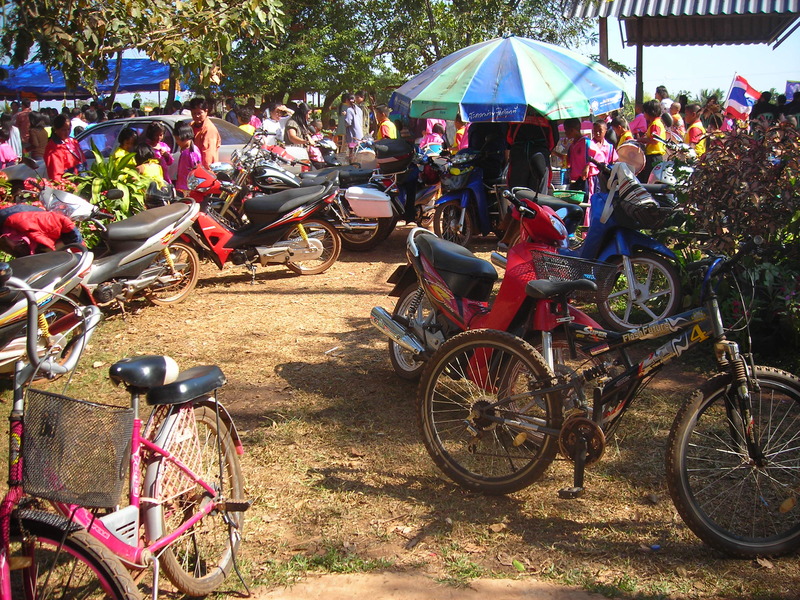 December 14-16 was “Sports Week” in Pla Pak Village, a three-day competition between 13 elementary schools (including my two schools) that took place in the large field directly across from the teacher housing compound where I live. I was actually notified in advance of sports week (and by “in advance” I mean I was told the Friday before sports week) so I was able to take care of some business since I didn’t have to teach. For example, I went to the Nakhon Phanom immigration office to get an extension on my work visa and made a necessary trip to Lotus (the local “superstore”-it really seems to have everything…except mosquito nets) to buy cake mix for Steph’s 24th birthday. Despite these great accomplishments, I couldn’t help but feel a little frustrated that three days worth of classes were canceled, putting me even further behind in my lesson planning after a previous week of holidays. Sports week was a great opportunity to see my students outside of class and build relationships with my co-workers. There were many familiar events such as track, football (soccer for those of you in the U.S.) and volleyball, as well as some new sports like “Da-Go,” which is like a mix between hackey sack and volleyball. Below is a picture that attempts to describe the sport. One thing that’s very apparent in Thailand is their love for sports-and sports attire. I was given the same orange and blue warm-up suit as seen on the far left in this picture. I wore it on Thursday, along with all of the other teachers at the competition, even though it was in the high 80’s by mid-day. 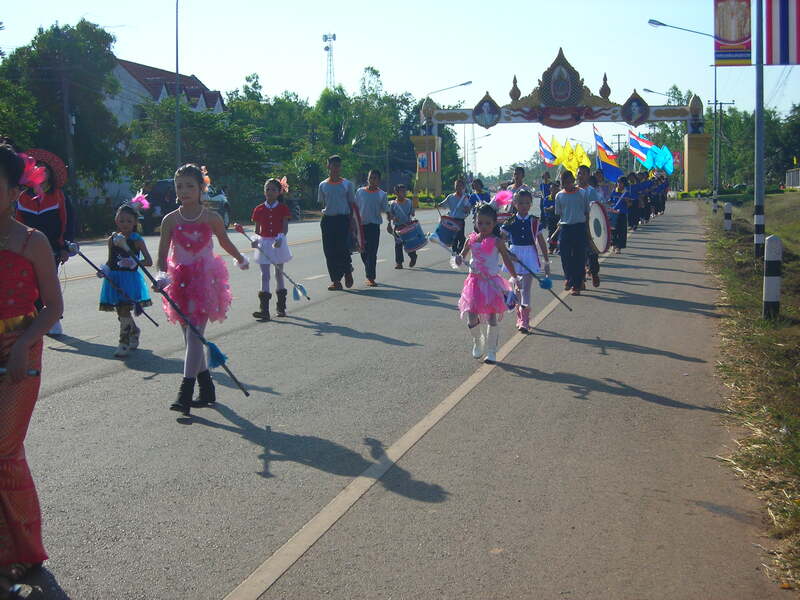 We also marched in a parade that morning, starting at a village temples and ending up on the high school football field. I still don’t think it’s a good idea to wear an unbreathable, dark-colored, polyester warm-up suit in Thailand, cold season or not. Here’s a shot of the parade I participated in on Thursday morning. Drum majors are another important component of sports week, as you can tell by their meticulously crafted costumes, make-up and hair. I was asked by both of my schools to practice with the drum majors after school and actually marched around the field with the baton, trying to keep the tempo with the entire school following close behind. Luckily I didn’t have to dress up like one for the parade. The large, gold-colored arch in the background is the entrance into our village. Nearly every village and city I have visited thus far has an entrance like this, with a picture of the king and queen. After the parade, and what seems like an eternity of cadences on repeat (note that each school had it’s own drumline…) the running events began. 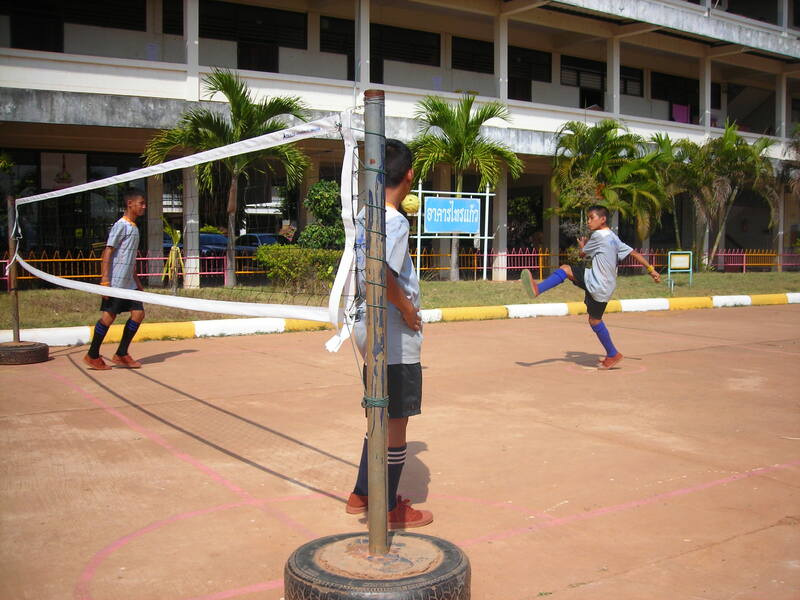 There are a few interesting things to know about track in Northeastern Thailand. One, the kids run barefoot. I am assuming this is because they cannot afford shoes but it also may be because the tracks are not paved and the grass could be slippery with shoes on. Two, track lanes are drawn with chalk! It was pretty cool to see how the lanes were “painted” for the events. 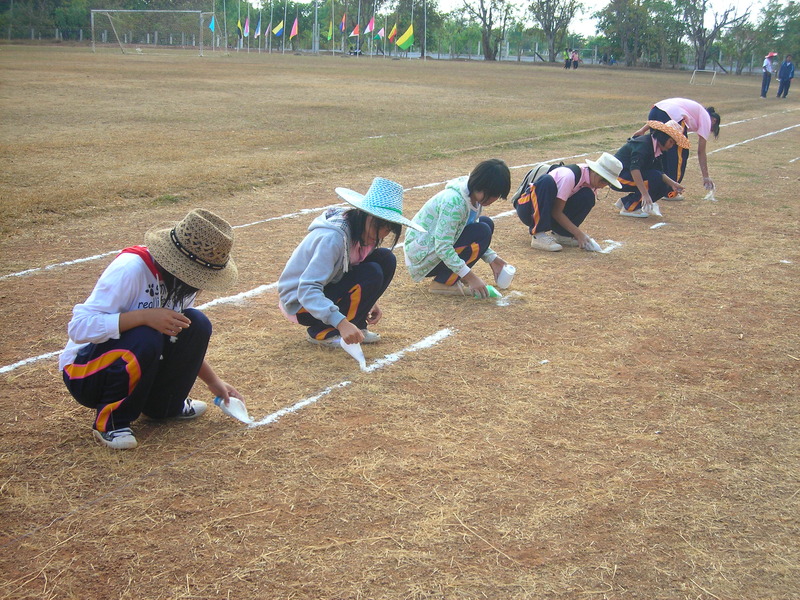 High school students were out the day earlier drawing lines with precise measurements, string, and wheelbarrows full of chalk. Luckily it won’t rain here until June so there wasn’t a chance of them washing away before the races started. I found out today that I’ll be “sporting” my warm-up suit again tomorrow for another day of sports. Naturally, classes are cancelled. That’s too bad because I was just getting back in my grove after three weeks of interruptions. Just as well…I am always up for some home team sideline cheering, especially when I have two teams to cheer for. This Saturday a group of WorldTeach volunteers and I will be heading to Pattaya and then Bangkok for the holidays. I hope everyone at home has a wonderful time with family and friends. Merry Christmas and Happy New Year!